The physical condition of school facilities is an important element of the school experience in the United States. To ensure that school facilities provide optimal conditions for learning, districts may need to build new facilities or upgrade existing facilities. During the first decade of the 21st century, public school systems in the United States spent, on average, over $20 billion annually on school construction (Baker and Bernstein 2012). [i] A recently released NCES report examined changes in school facilities in the U.S. from 1998-99 to 2012-13. How did the average age of schools’ main instructional buildings change from 1998-99 to 2012-13? In school year 2012-13, schools’ main instructional buildings were 19 years old, which was older than the average age of 16 years in the 1998-99 school year. [ii] In addition, on average, large schools were newer than small schools (by 8 years) and medium-sized schools (by 5 years) in 2012-13. 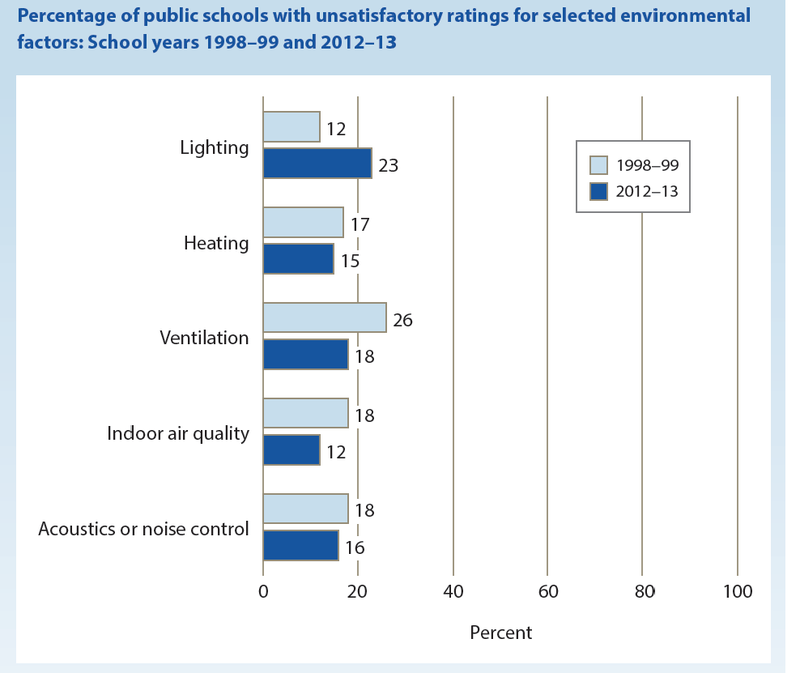 How did dissatisfaction with schools’ environmental factors change from 1998-99 to 2012-13? In the 1998-99 school year, ventilation was the factor rated as unsatisfactory for the highest percentage of public schools while lighting was the lowest. However, by the 2012-13 school year, the percentage of public schools for which ventilation was rated as unsatisfactory had dropped, and the percentage for lighting increased. In fact, lighting was the only environmental factor that was rated as unsatisfactory for a higher percentage of public schools in 2012-13 than in 1998-99. Was there a difference in the percentage of schools that needed money for repairs, renovations, and modernizations from 1998-99 to 2012-13? What was the estimated cost of these projects? The percentage of public schools that needed money for repairs, renovations, and modernizations to put onsite buildings in good overall condition was lower in 2012-13 than 1998-99 by 23 percentage points (53 vs. 76 percent). However, the average cost of these projects was estimated to be $1.4 million more per school in 2012–13 than in 1998–99, adjusting for inflation. Was there a difference in the percentage of schools with plans for building improvements in the next 2 years from 1998-99 to 2012-13? A lower percentage of public schools in the 2012–13 school year had plans for building improvements in the next 2 years, compared to 1998-99 (39 vs. 48 percent). However, approximately 39 percent of public schools in the 2012–13 school year had plans for major repairs, renovations, or replacements to at least one building feature in the next 2 years. [i] Baker, L., and Bernstein, H. (2012). The Impact of School Buildings on Student Health and Performance: A Call for Research. New York: McGraw Hill Research Foundation. Retrieved March 10, 2015, from http://www.centerforgreenschools.org/sites/default/files/resource-files/McGrawHill_ImpactOnHealth.pdf. [ii] The age of the school was defined based on the year of the most recent major renovation or the year of construction of the main instructional building if no renovation had occurred.